Our names are Kelly, Tyler, Mark, Brad, & Seth. We are independent music teachers in Dunwoody, Georgia. We teach piano, drum, bass and guitar lessons to students of all ages, and specialize instructing beginner and intermediate students. We have over 45 years combined teaching experience, have performed with musical acts and ensembles, and have undertaken advanced study of music. We truly enjoy teaching music lessons and love watching students develop into skilled musicians. 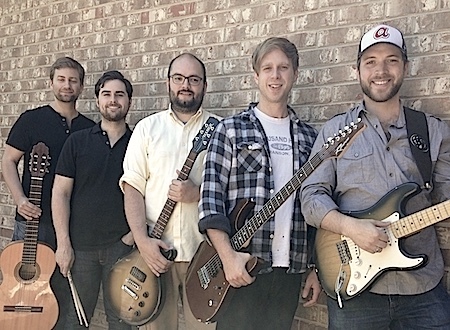 Pictured left to right: Kelly McCarty, Tyler Hester, Mark Gallegos, Brad Jackson, and Seth Watters. If you are interested in Violin Lessons, please visit our friend Alison James over at the Dunwoody Conservatory of Music to learn more! If you're in the Decatur area, check out our bros Kevin and Kelly, who teach bass, drum, and guitar lessons in Decatur, Georgia.